LEARN HOW TO CREATE AMAZING PROMOTIONAL VIDEOS WITH THIS COURSE! Dark Forest is a series of tutorials that covers the whole process of creation of a promotional video in which a camera flies through a forest and shows some glowing titles with the beat of a soundtrack. The tutorials go from the inception of the project, its preproduction and organization, through the whole modelling, sculpting, texturing and animation stage up to the render (with Cycles), lighting and compositing! 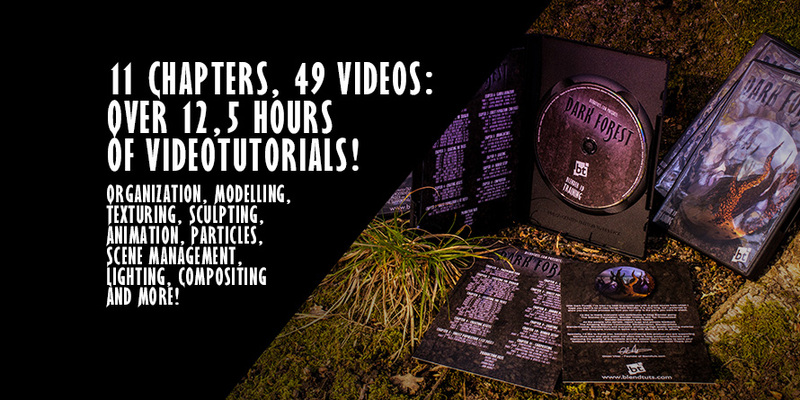 The series is made of 11 Chapters containing 49 videos: Almost 13 hours of tutorials!! This series assumes you have at least a basic knowledge of Blender Interface and tools. Advanced knowledge is not required at all and everything is explained step by step. As a rule of thumb, if you can follow the free tutorials from blendtuts, you shouldn't have problems following Dark Forest tutorials. Even though Dark Forest is only a downloadable product, it's been crafted to fit into a DVD, so you can burn the full course, print the cover designs and put it in your shelf! I've put all my knowledge together to create a high quality product from which you can learn a lot. While the tutorials show how to create a forest, everything is thought in a way that you can extract the workflow and the essence of the whole series to overcome any other type of project and know what steps you should follow. Also, it includes the Production Files so you can mess around with the .blend files and start at any point of the process just by loading the desired file. I'm so confiden't you'll like it and learn so much from it, that I'll refund all your money if you don't, no questions asked! Take it and check it out, and if you're not happy within 30 days, just CLICK HERE to send me an email with your order's info. You have nothing to lose! What Do People Say About Dark Forest? Do you have any question regarding Dark Forest? Are you experiencing some issue when registering or after you purchased this product? You're not receiving the email with your downloads within 10 minutes* after your payment? CONTACT ME and I'll get back to you as soon as possible! *You should get your downloadable files in an email right after your payment. Please, check your spam folder just in case the email goes there. If you don't get it within a few minutes, contact me and I'll solve it asap.